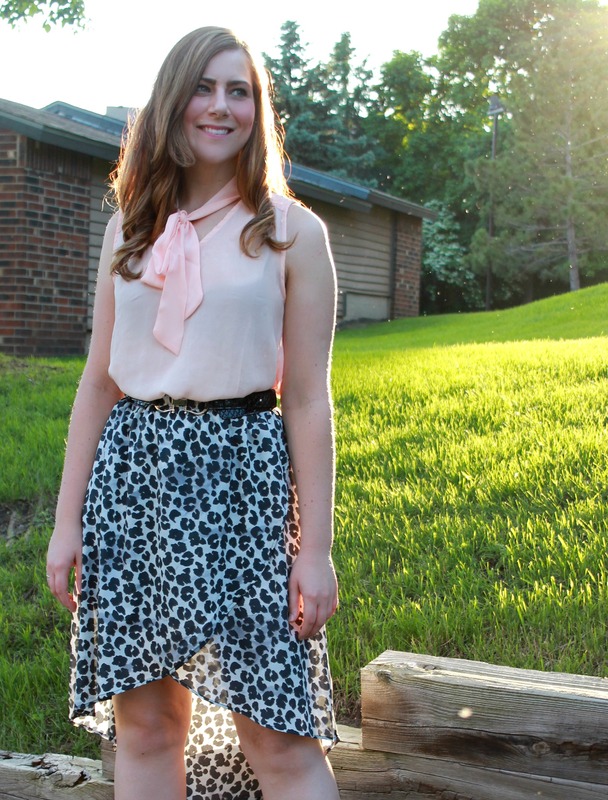 I adore this leopard print skirt, it is so comfy and perfect for the summer. I have thought about finding a pencil skirt in reptile or leopard print, but how fun is this hi-low skirt? I know it isn’t as trendy as it was last year and I know a lot of people aren’t fans of this trend in general, but I like this skirt because it is a subtle high-lo style, not above my knees and then all the way to my feet in the back. Add an adorable peach bow-tie blouse and belt and I was set. This is my second outfit featuring items from 10DollarMall.com (you can see my first feature here and another outfit featuring a blouse here) and again if you are looking for some affordable, yet high quality pieces, definitely check them out! This outfit in total (without shoes) is only $22.00 and ($62.00 with the shoes) and these pieces are easy to mix in with my closet. 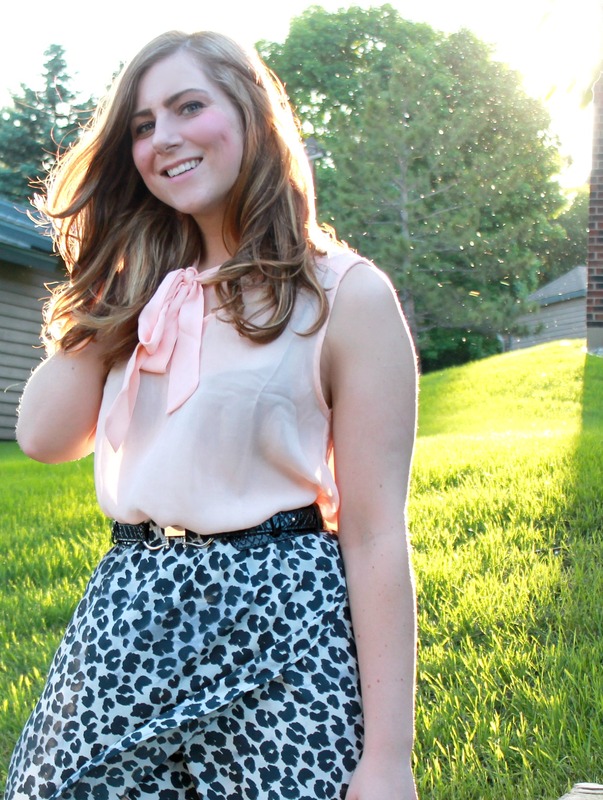 I know I will be wearing this bow-tie peach blouse a lot this summer at the office! I could also polish up the skirt with a blazer or wear it out for happy hour and drinks with friends. Also, just a note about shopping at affordable places like this. I don’t do it to buy 10 pieces for $50 instead of one piece I’d really love for $50. I do it to add pieces wardrobe that I will actually wear again (like my orange blouse). 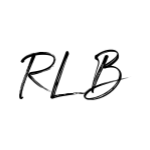 You want to have things in your closet that you REALLY want to wear all the time and that FIT you whether the item cost $5 or $100. Trust me, through my whole closet cleaning (which is still going on….) I have been able to get dressed so much easier in the morning because I like what I see hanging up and I don’t have to worry about whether or not it will fit properly. You look great love that hi-low skirt on you and I always love leopard print. You look so pretty in this floaty, feminine outfit. Can’t go wrong with leopard! If you’re interested, I’m hosting a giveaway for a Gerard Yosca necklace from his upcoming collection. Enter here. This is such a pretty outfit! I am in love with the feminine blouse! Hope you enjoy your weekend! 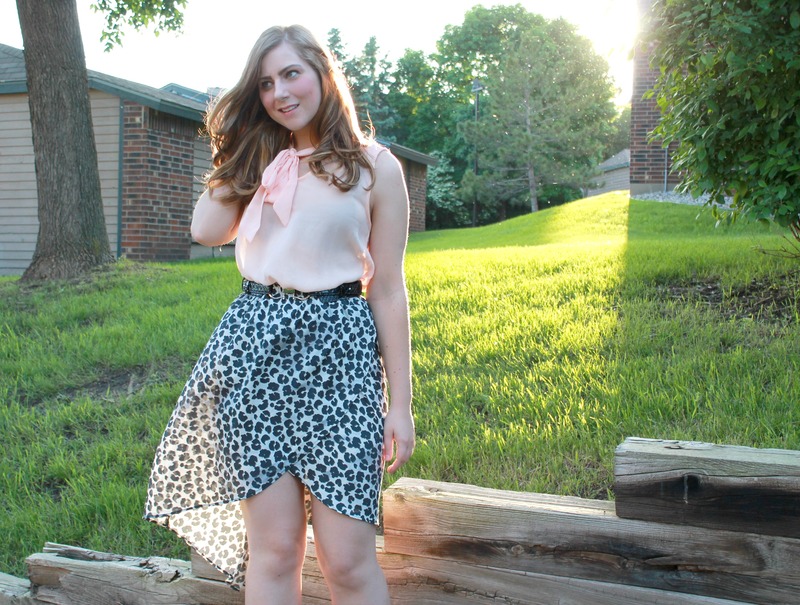 I’m so in love with that easy breezy skirt…..totally screams summer! I love the skirt! The high/low is a neat effect and the animal print is so fun! 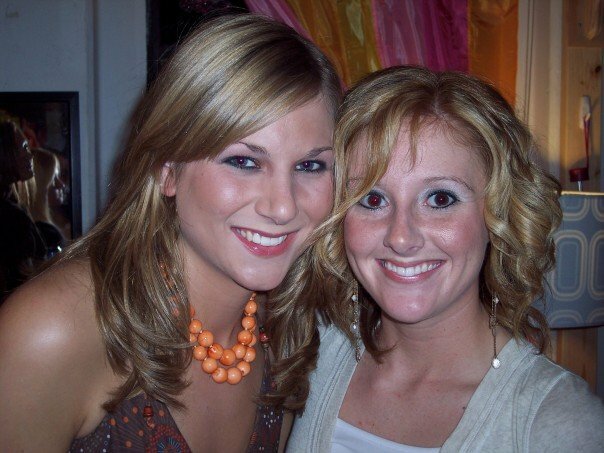 Have a blast at the wedding this weekend!! The wind blowing your hair in that photo=model status! Really love this skirt! Great look, the top and skirt combo look so god together! I love this look, the top and skirt look great together! The color of this top is SO perfect on you–you’re all glow-y and gorgeous! I agree with so much you said! I think the hard part about thrifting/discount shopping is to get carried away about how cheap everything is, but if you don’t like it, even if it’s only $2, it’s not worth it. I’ve learned that (and am still working on it) the hard way. 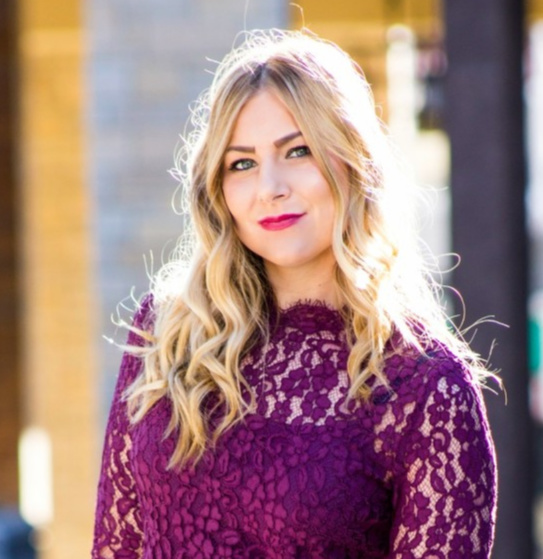 AND YES to cleaning out your closet making getting dressed easier. I am so much happier now when I go find something to wear because 1. I don’t feel guilty about the clothes staring at me because I haven’t worn them in years and 2. I like everything so I just want to wear everything! It is REALLY hard to say no to things that cost less than $5, but even over the past few months I’ve done it a few times. I am trying to be a SMART budget shopper, not just a budget shopper. AND yes to the closet cleaning indeed! I can’t believe I was keeping so much that didn’t fit or wasn’t even my style anymore! Love the skirt Rachel! So cute! What a pretty skirt…I really love the cut of it! Happy Friday! What a pretty skirt! Have fun this weekend! I so love that blouse Rachel! The bow and color are so feminine! Have a great weekend at your friend’s wedding! I love the blush pink color of your blouse and the high low hem on your skirt! You look gorgeous as always! I like that skirt. Great weekend. As usual you look fabulous! I love the high-low tulip skirt. 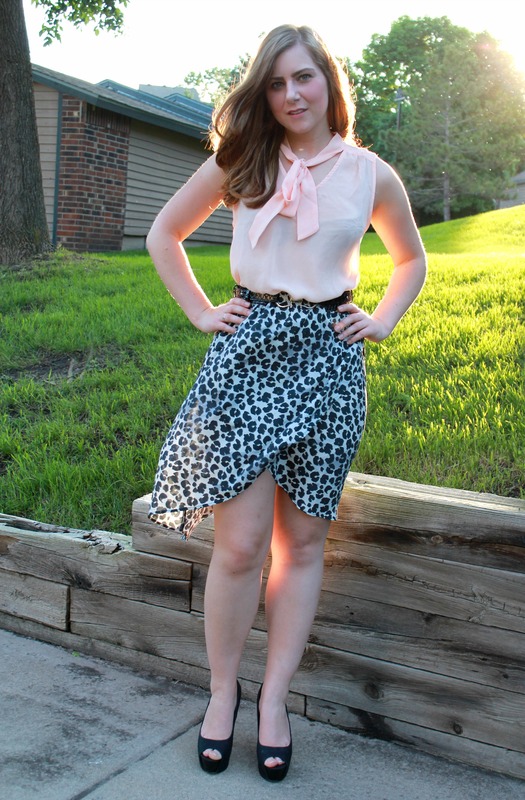 Love how you styled the skirt, very pretty look! P.S. 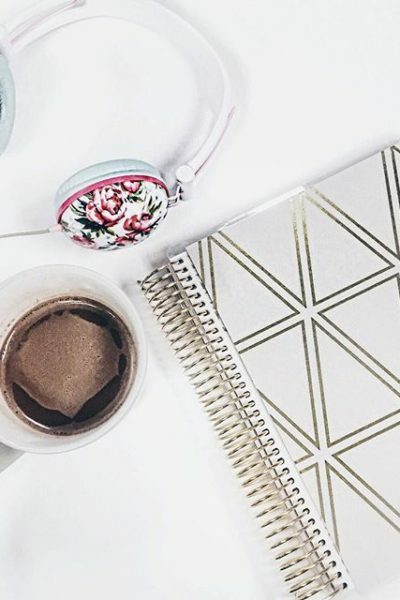 I’m giving away EIGHT sponsors spots today and I would love for you to come enter! 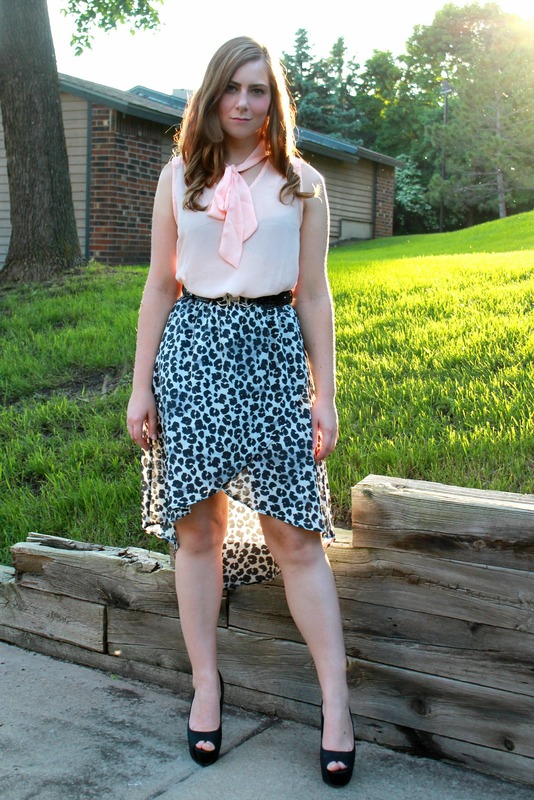 I love the mix of leopard with that blush pink top! Adorable! You look so great I love your skirt so much!! Cute post. 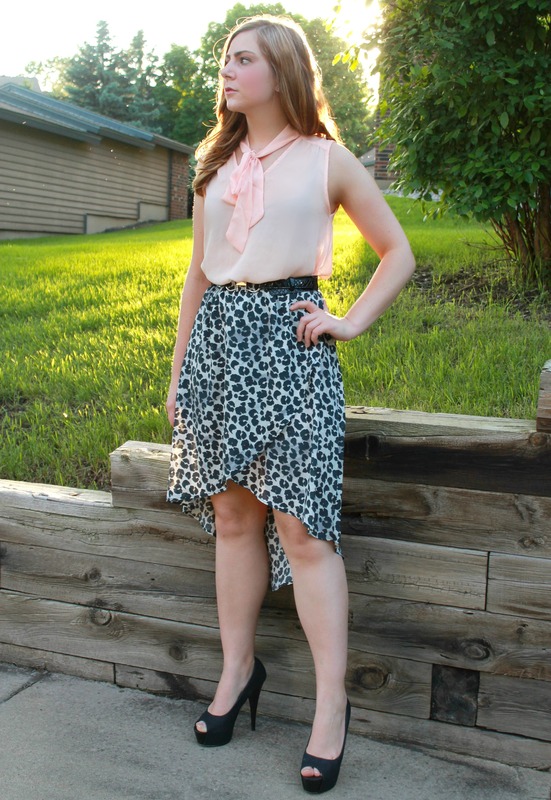 Love this blush color on you, and that skirt is so fun.